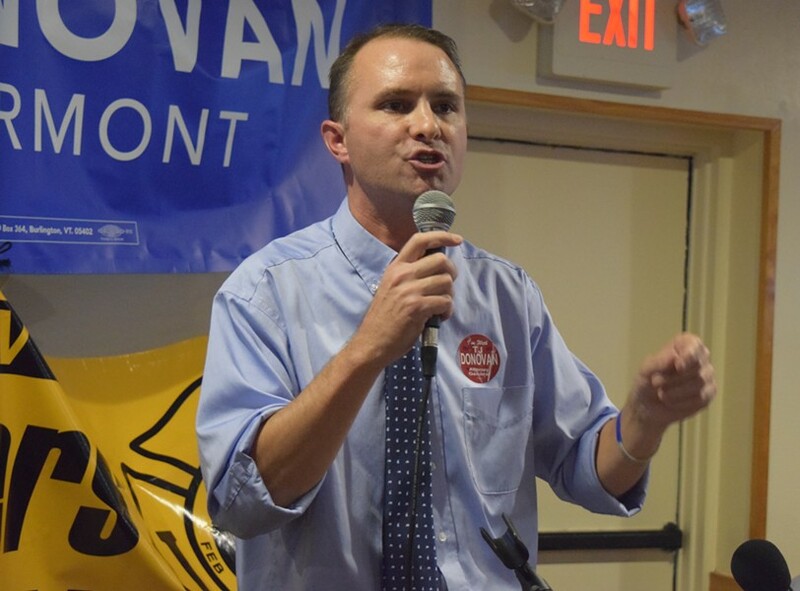 T.J. Donovan kicks off his 2016 campaign for attorney general. Three years ago, Democrat T.J. Donovan ran a rambunctious, upstart campaign challenging his party’s incumbent attorney general. Donovan was back Thursday night before a boisterous crowd at the St. John’s Club in Burlington, kicking off what promises to be a very different bid for attorney general. This time, Donovan has no clear opposition. Incumbent Bill Sorrell, who Donovan nearly defeated in 2012, has declared he won’t seek reelection after 19 years in office. And Donovan, who’s been Chittenden County state’s attorney for nine years, has built a broad coalition of supporters that suggests he might not face much opposition. That was on display Thursday, as a who's who list of those active in Vermont politics — from Progressives to moderate Democrats — turned out to back the 41-year-old Donovan, who announced his plans to run in June. “He understands that poverty is one of the reasons why people become embroiled in the criminal justice system and one of the reasons why they get stuck there,” Barbara Prine, a Legal Aid attorney, told the crowd. In the audience were others on the left side of the political spectrum: former governor Phil Hoff, Sen. David Zuckerman (P/D-Chittenden), former Progressive Party executive director Robert Millar, union leaders and Donovan's mother, Rep. Johannah Donovan (D-Burlington). Donovan also drew support from more moderate Democrats: Sen. Richard Mazza, a Democrat from Colchester who's also backing Republican Lt. Gov. Phil Scott in the race for governor; Senate President Pro Tempore John Campbell (D-Windsor) and Burlington Mayor Miro Weinberger. No Republican candidate for attorney general has surfaced yet, despite the lure of a rare open seat. “There has been interest,” said Vermont Republican Party Chair David Sunderland, though he declined to identify possible candidates. Shane McCormack, a Republican from Underhill who mounted a late challenge against Sorrell in 2014, said he will not run again in 2016. “There’s likely so little daylight between me and T.J. on the important, substantive issues … that I’m convinced I’m not the one to present a real alternative in this race,” McCormack said. Donovan, in his speech Thursday night, said as attorney general he would emphasize drug treatment over incarceration, which he has done as county prosecutor. “We need to listen more, judge less,” he told the crowd.